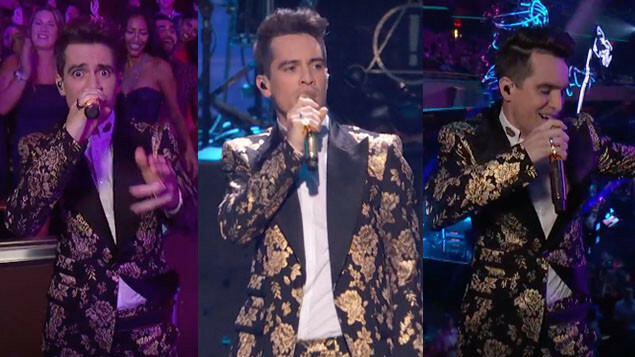 Brendon Urie took to the stage in New York last night (August 20th). Panic! At The Disco were among the performers at the MTV Video Music Awards, which took place last night (August 20th) at New York's Radio City Music Hall. Brendon Urie performed 'High Hopes' from current album 'Pray For The Wicked', starting off on a crane over the crowd before hi-fiving various audience members as he made his way to the stage. We demand a cover version of 'I Want It That Way' immediately. Panic! At The Disco were nominated for Best Rock Video alongside Fall Out Boy but ultimately lost out to Imagine Dragons. MTV have also reposted Panic! 's classic performance of 'I Write Sins Not Tragedies' from the 2006 ceremony, where they took home the prize for Video Of The Year.